So the thing I keep meaning to post about, but then get distracted by how busy life is these days, is… I’M GOING TO PARIS IN MAY! EEP! SUPER exciting! I’ll be visiting Lisa, who lives in Paris, for a week and a half. 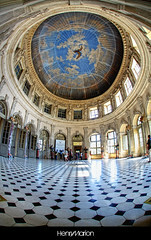 I’m going to be going to Vaux-le-Vicomte! 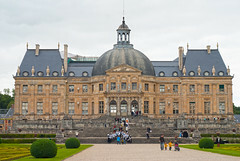 Which is the French chateau that was the inspiration for Versailles. Specifically, to the Grand Bal Costume — a 17th/18th century (required! yay!) costume ball, with dinner beforehand. The ball will be in the Grand Salon, which sounds very promising; and will have a Baroque musical group, and period dancing. (Side note: I am amused that the ball goes from 11pm-3am, which is so VERY European!). There will be fireworks in the garden. I may die of happiness! And then on Sunday, I’ll be going to the Journee Grand Siecle, which is a 17th/18th century costumed afternoon at Vaux where attendees are encouraged to bring picnics, plus there are various demonstrations/activities. I am BEYOND excited! I hope to meet/re-meet many European costumers I’ve chatted with online. And and…TWO COSTUME EVENTS IN NOT JUST PERIOD BUILDINGS, BUT OVER-THE-TOP FABULOUSLY PERIOD BUILDINGS!!! Where history happened! Of course, there will be other adventures — I plan to spend as much of a day as I can stomach at the Louvre. And there’s other costume stuff… but I’ll save that for the next post! Oh, input desired! I am going to wear my 1780 polonaise for the picnic day. Which francaise should I wear to the ball — the peach or the black? I am purposely NOT stressing myself by trying to make something new for this! That is beyond fabulous, lady! I am soooo envious! What a fabulous trip you have planned! Both gowns are awesome but I vote Peach for the ball, especially if you can do the big hair thing you did with the black gown. The reason is I’m guessing that peach will stand out and look more dramatic in a dark evening setting. And maybe a lighter color for the gloves? Your skin is luminous so maybe you don’t need gloves. I’m SO ENVIOUS! And so happy for you of course. And definitely the peach. I love black dresses but the peach more like a showy ball gown. My goodness, what an opportunity. What a dream come true! For voting, I remember seeing both dresses in past posts. The trim on the black is perfect for a ball setting, but the peach color and cut look better, somehow. Perhaps tack on some paste brilliants, spangles or goldwork to the trim to add a little extra sparkle and glow? It’s Paris in spring! You must go peach. OH MY GOD!! I visited Vaux-le-Vicomte and thought “I want to run around in 18th century dress.” Who knew they actually host an event for that?? Have a wonderful time! I think the peach gown is more you. And would look all glowy & extra-pretty at the ball. Everyone: thanks for your input! The peach it will be. I was mulling Natalie’s suggestion for adding some spangles — I like the idea, but not sure if it works with the current trimming (and while I briefly thought about retrimming the dress, I realized that was ridiculous). So the peach it is, and I’ll keep mulling if there’s a GOOD way to incorporate more shiny! I say go for the peach. Its so light – perfect for springtime in Paris! I vote for the peach too. I’m so excited for you! I can’t wait to hear (and see pics) of your trip – it’s a costumer’s dream! Sooooooo envious – I have been eyeing these events for some time. So happy for you that you are going and looking forward to a full photo report upon your return. As for the dress – nothing says “spring in Paris” like the peach francais!